CAIRO. As Egypt’s military regime is launching a ‘war on terrorism’ the country’s society is getting more and more divided between the Muslim Brotherhood and supporters of the military regime. Meanwhile, third actors that could mediate between the two conflicting parties are getting more and more marginalized. Similar to many other Egyptians, sitting in one of my favorite ahwas in the neighborhood has become a ritual for me. The flat screen television on the wall showcases the European super-cup. Bayern Munich plays against Chelsea London. Two hours where Egyptians manage to escape from the destructive reality of Middle Eastern Politics. The passion for football unites our neighborhood, which, in the light of the deadly cycle of violence of the last two months, has become deeply divided. The dense smoke of shishas and the sweet taste of Turkish coffee, paired with sports, is also a temporary relief for me, as I have already been engaged in political debates for hours. Most of the men who gather here every evening have known each other since their early childhood. However, there are also unfamiliar faces sitting right next to us. While most Syrian refuges have moved to Lebanon, Jordan and Turkey and Iraq, Egypt has become the country hosting the 5th largest contingent of Syrians who have fled civil war in their country. For them as well, the European Super Cup seems to be a way to enjoy themselves, at least for a little while. As 90 minutes are not enough to determine a winner the match is going into extra time. Looking at the excited faces of the men around me I sense a feeling of gratitude for the fact that political debates will be suspended for another 30 minutes and I experience some extra moments of peacefulness in this hyper-masculine space (women are not welcomed in most traditional ahwas). Finally, the match is over and almost immediately I find myself reengaging in intense political debates. Emotionally, often even aggressively, people are arguing either in favor of the Muslim Brotherhood or of the military. The future of Egypt is at stake here and people urge me to take sides as well, yet for the most part I have mainly been observing and listening to the heated arguments. The flat screen on the wall now shows the national news. While social media like Facebook and Twitter have been extremely important for the younger, urban population to organize itself without any central leadership, state television has remained of central influence for public opinion making. 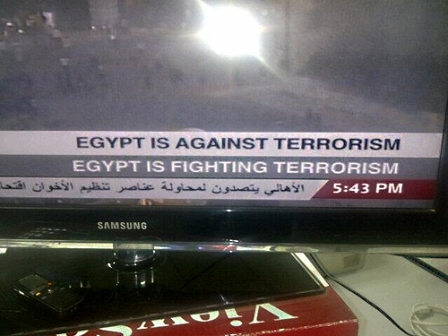 Almost every Egyptian house is equipped with a television and the military is making extensive use of this means of propaganda. When thousands of Islamists are protesting in the streets of Cairo and other big cities of the country, state television is showing empty streets, pretending that the whole country is under the successful control of the military. Meanwhile the military regime is oppressing media that is broadcasting not in line with the national propaganda, such as Al Jazeera Mubashir Misr, which was declared illegal by the Egyptian Ministry of Investment, Information and Communication Technology, a few days ago, a step that has been condemned by Reporters without Borders. As I am trying to find the right words to express my viewpoint about this extremely complex Egyptian conflict, the national news presenter is downplaying the number of protesters that have participated in all major cities of the country. Indeed the number of participants has remained clearly below the expectations of many Islamists but still a considerable amount of Egyptians have joined the protests this Friday as well. After the brutal escalation of violence at the Rabaa Al Adawaya massacre, there is now a considerable amount of outrage among many Islamists. Remarkably many of them have exchanged their Morsi posters with a sign that shows four fingers. 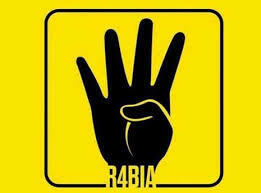 Rabaa is the Arabic word for ‘fourth’. The new banner of the opposition has become a call for justice for the victims of the Rabaa massacre. This call for justice of course is an implicit call for counter violence. Regardless of who will try to implement justice, this will most probably trigger a violent counter-reaction by some stakeholders in the conflict. Having said that, I of course also understand the fear of many secularists, who had taken the Egyptian revolution to the streets again, during the June 30 protests, which probably have been the largest in human history. These protests had followed a year of oppressive Islamist rule that in many ways had undermined Egypt’s young democratization process. Many Egyptians had been fearing a strict implementation of Sharia law, people had been struggling with an almost collapsing economy, with massive marginalization of women in political institutions as well as with hate speech that has led to a serious escalation of violence against religious minorities – to name just a few reasons for an extremely negative experience with an experiment called ‘democracy’. Indeed, over the past two years, democracy has become an instrument for the respective opposition, regardless of whom that was in a given moment, in order to gain control over the political institutions of the country. Once in power, however, those actors overwhelmingly often became quite authoritarian, reproducing many patterns of the old Mubarak regime. This is true for Islamists and secularists. Back at the ahwa, the men on the table now sit in silence. Everybody seems curious to finally find out which camp I belong to. Looking at the Syrian refugees on the table next to me (who drink water instead of coffee or tea, because they simply cannot afford paying the bill and who are certainly among those who would suffer the most from a further escalation of the Egyptian conflict), I answer with a counter question: What has happened to the plurality of political positions and ideologies, which I have always perceived as one of the most beautiful qualities of the Egyptian uprising? Isn’t there any space left for political actors that position themselves beyond military rule and Islamism? This entry was posted in Egyptian Uprising, Syrian Civil War. Bookmark the permalink.